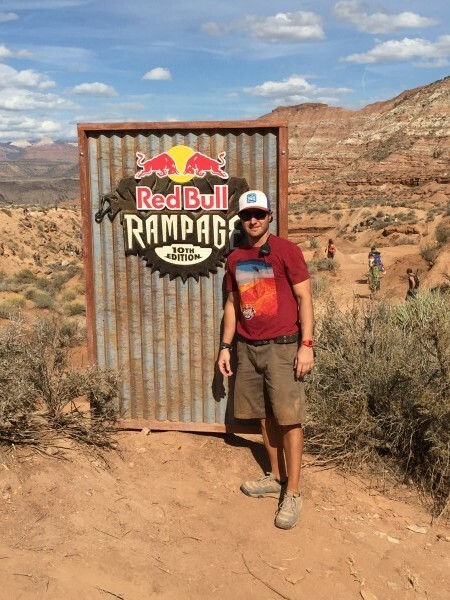 Dominic Vincentini MS, ATC, Assistant Athletic Trainer, recently traveled out to the rural, mountainous terrain of Southwest Utah as a member of the medical staff for Red Bull Rampage, October 13th to 18th. Red Bull Rampage is an invite only free ride mountain bike competition held near Zion National Park in Virgin, Utah. The event is very similar to that of freestyle skiing or snowboarding where riders are judged on their choice of ‘lines’ down the course, technical riding ability, and complexity of tricks. In terms of magnitude, Red Bull Rampage has become one of the biggest mountain biking events of the year. Riders lines consisted of narrow bike paths on the mountain tops ridge, steep vertical drops, giant step down jumps, shark fin landings, a 90+ ft canyon gap jump, and man-made kicker jumps, just to name a few. This event gives a unique opportunity for Vincentini to hone his emergency medical and risk management skills as the course was rode each day by these extremely skilled and courageous athletes.